Details: 4 BR, 4.5 BA Waterfront Property with 2,510+/- sq. 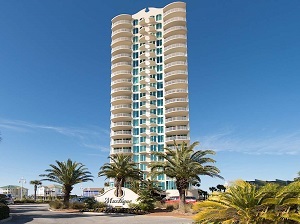 ft.
Gulf Shores Alabama beachfront condo for sale at Mustique. This 4BR/4.5BA condo lives like a residence with an open, sprawling floor plan. Complete travertine floors throughout and all travertine shower surrounds. Luxury finishes and tasteful appointments compliment this hidden jewel of the gulf coast. High ceilings with crown molding t/out and tinted, floor to ceiling glass in every room. 3cm granite in the kitchen w/tumbled marble backsplash and undermount lighting. Stainless GE Monogram appliances. Large master suite with balcony access. Exclusive elevator access to your front door. Private 50' beach access. Paver pool area with zero entry, spa hot tub, indoor pool, fitness, sauna, steam and meeting area. Pier and gazebo on Little Lagoon. .…there’s more – come see this one!